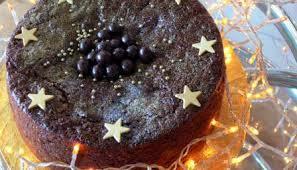 I found this unusual way of making a fruit cake on YouTube. 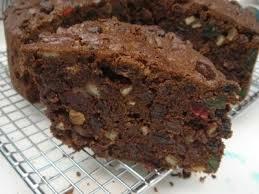 I thought this cake was really different,but i still hate fruit cake LOL! But this is really good and family (my Mom) liked it. Generously grease a 9-inch tube pan. On wax paper, sift together flour, sugar, cocoa, baking soda and salt. On another sheet of waxed paper, mix together walnuts, candied fruit, raisins and dates. In large mixing bowl, beat eggs, sour cream, and vanilla until blended. Add Challenge butter, flour mixture, and blend well. Beat with mixer medium speed 1 minute. Add walnut and fruit mixture, and fold in well distributed. Turn into prepared pan. Bake in preheated 300 degree oven with a shallow pan of hot water on floor of oven until cake tester inserted in center comes out clean, about 1 3/4 hours. Cool in pan placed on wire rack 10 minutes. Turn out on wire rack after loosening edges.